We hitched a ride this morning into Geneva's airport with Donald, who was the librarian at the institute and was heading back to England with his wife Margaret in a few days. 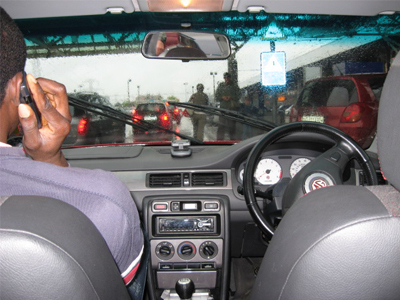 This is the interior of their MG, with the steering wheel on the right-hand side. It's correct for Britain, but the fellow in the picture had to hand over the parking billet, since the Swiss booths are on the opposite (United States) side. As you can tell from the windshield above, the weather was being uncooperative. Nevertheless, we went into the city from the airport, visited the tourism center. We learned that there was a little open air train that went around to the old part of the city, and despite the dripping, we took it to get our bearings. 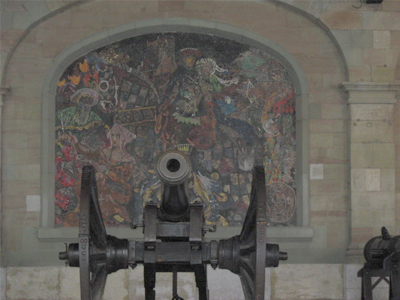 The arsenal's canon was cast in 1683. 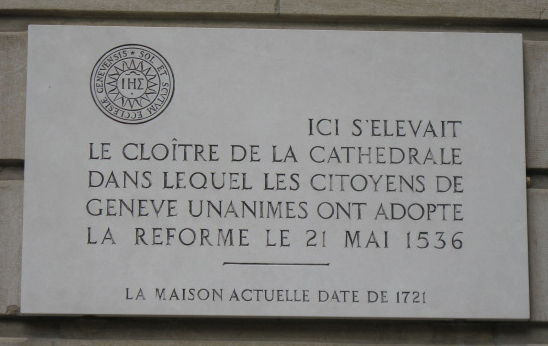 Translation: Here stood the cloister of the cathedral in which the citizens of Geneva unanimously adopted the Reformation on May 21, 1536. The actual house (to which the plaque is affixed) dates from 1721. 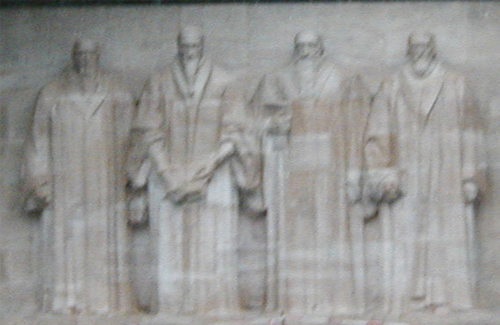 We passed the historical places we came to Geneva to inspect: the auditory where Calvin preached, St. Peter's cathedral, the Reformation museum, the library on the university campus, and opposite that, the wall of reformers, on which were perched bas-reliefs of Genevans Calvin, Farel, de Beza, and Knox, flanked by other European reformers including Zwingli and Luther. We found a pub in which to have some late lunch while the outside sogginess continued. 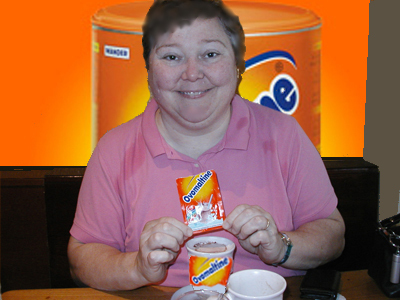 Yes, the photo's a joke, but the Ovomaltine (we call it Ovaltine) was comforting on a cold and rainy day. Since returning to the old town would require more walking in the rain than I was willing to do, we decided to tour the vicinity of the train station to window shop. There were many watches, Swiss army knives, and lots of jewelry along the route. We stopped in at a jeweler's store where I spied a fob watch whose front and back covers opened to reveal the works inside. That watch is now in James' pocket on Sundays. There was also an interesting mechanical lady's watch with a view of its innards which now sits on my wrist. The shopkeeper gave us a langniappe of a couple of baseball caps with our purchase, too, which I thought was exceedingly kind of him. Breakfast and dinner during our stay were on the house at Château Bossey, so in due course we started back. 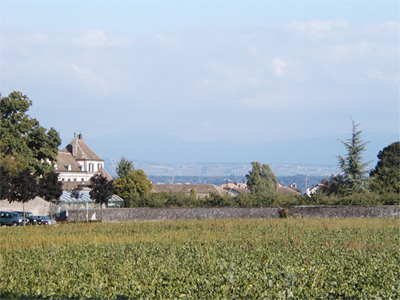 The first leg of the journey involved the train from Geneva to Coppet, a picture of which appears above. 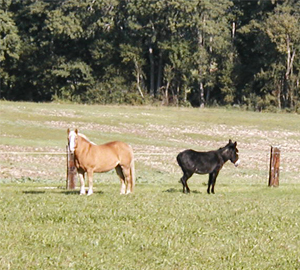 From Coppet we took a local bus to Célingy, where this horse and mule shared a corral, and from Célingy we hoofed it the remaining two miles or so to our quarters. This particular wet evening we were greeted on our way from Célingy by a long line of wedding revelers cramming the road to the château, blowing their horns and making as merry as is possible from behind their steering wheels. As there was only one road into the campus, we could not but join the rejoicing. However, not wanting to intrude upon the party, we took the long way around the buildings to our room. Donald, who drove us in to the airport this morning, was again the unofficial greeter at dinner as he was at breakfast. Most of the people who were present at the Institute, either just passing through like James and me, or there to study for any length of time, gathered around four tables grouped together and ate dinner. Many were from Africa or Europe, and the common language was a sort of Franglais, more French than English. I had an interesting conversation with a Roman Catholic priest from Ghana who was astounded at the freedom of speech we Americans take for granted, particularly the freedom to criticize those in power. There was also a lot of talk of the upcoming United States presidential election. One of the group mentioned it was good that Mr. Bush's term was ending, saying "The American people deserve better." It was interesting to hear what a different point of view these people held.